In keeping with our tradition of the last several years, Mr. Karen and drove to Illinois for Thanksgiving with my family, taking a less direct route than usual to avoid as much of the snow as possible. Even with 4-wheel drive, we figured there’s no reason to tempt fate by heading right into the lake effect area if we didn’t have to. We still got snowed on and blowed on and at times had to slow down, but we didn’t lose too much time to the weather. In a refreshing change of pace from last year and the year before and the year before that, we did not get stuck in traffic on the Skyway route through the Chicago. Instead, we got stuck in traffic on the Tri-State. Oh, how I hate toll plazas, and the signs that promise an end to congestion once the construction for open road tolling is complete are no comfort whatsoever. Unless they plan to sell a short-term use version of the I-Pass that costs less than $50 and can be obtained without me providing my credit card, driver’s license, and license plate, make, model, color and year information for each vehicle I want to use it with, I won’t be getting one, so I’ll still have to stop and wait to pay, getting increasingly frustrated when I see my lane is stopped completely while the toll taker has a lengthy conversation with the driver of the car at the head of the line. Any talking beyond “Happy Thanksgiving; here’s your change” is too much when the backup is a half hour long. Unlike the last three years when my brother cooked, this year Mom took back hosting duties. 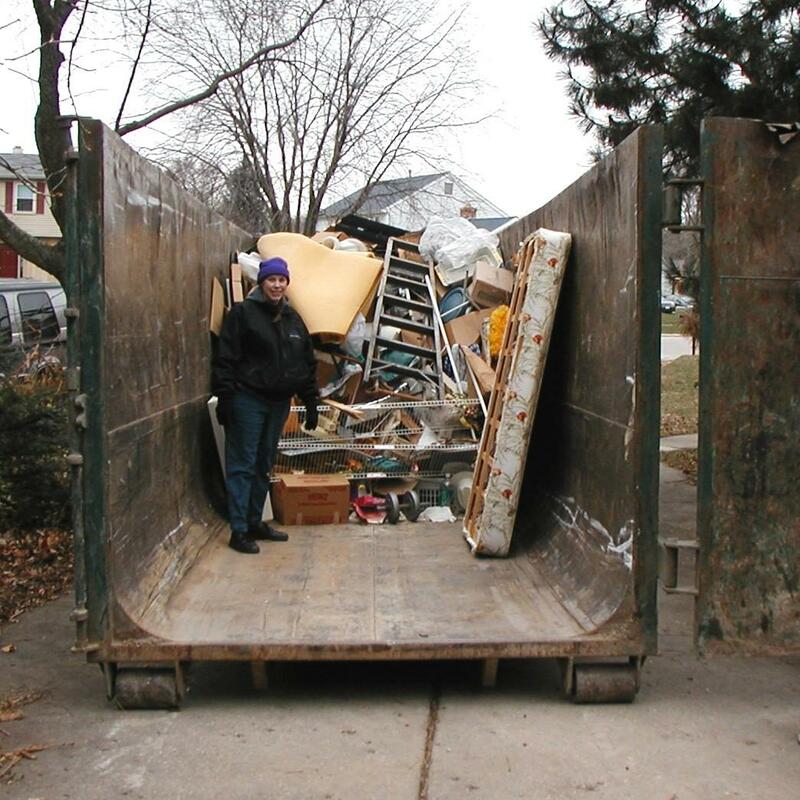 Earlier this year, she’d decided to have a “dumpster party”, where the family would come help her clean out her garage and basement. Originally, she was going to have this in early fall so we’d have a chance of the weather being neither too hot nor too cold, but she kept moving the date out and finally decided to have it over Thanksgiving when Mr. Karen and I would be coming anyway. I wasn’t convinced it would actually happen until we drove up and saw the dumpster in her driveway. By the time we got there, my brother and his wife had already made a dent in the stuff in the garage. I started with the boxes of stuff that got packed up when someone else moved into what was my bedroom after I moved out on my own after college. Yes, that was a long time ago, and I really should have gotten around to sorting it out long before now, but if you ever saw my mom’s house (or my dad’s before he died), you’d know that dealing with stuff is not exactly my family’s strong suit. But now the time had come and I went through the boxes my mom had grouped together for me in the front hall closet. The first three I grabbed turned out to be empty. I’m not sure if they had things in them at some point; if they did, I sure don’t know what those things were. When I got to boxes that did have stuff in them, I ended up getting rid of most of it. I do not need the programs from all the band concerts I was ever in or the buttons with the mascot of my junior high school on them (or the ones from high school, which I gave to my niece, who’s now on the pom pon squad at that same school and can wear them to basketball games as a conversation piece). I did save some things, of course, like the sake set my dad brought back from Japan. I also found the row counter that I searched my own basement for when I started knitting again; I kept that even though I’ve now bought a new one. We all took a break to eat Thanksgiving dinner, served buffet style on paper plates (but they were Chinet, the king of paper plates) so we could get back to work more quickly. There was plenty to do, that’s for sure. We all kept at the sorting and trashing until it was too dark and cold and late on Thursday, then got back to it on Friday morning. 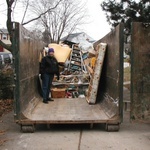 We did manage to get a lot of stuff cleared out, but not surprisingly there were a few disagreements along the way after my brother and I got through our own stuff and started on the general junk. My mom had told me that if two people agreed something should be thrown out, it could go in the trash, but more than once she had us take something out of the dumpster even though three or four of us thought it should go. She was also much more likely to want to put things in the donation pile, stuff the rest of us didn’t think should be inflicted on anyone even if they were going to get it for free. We made some interesting discoveries along the way–important legal papers in both the garage and the basement (and not in the desks or filing cabinets in those places, either), an old Coke machine with miniature picket fence sections inside instead of bottles of pop, my wedding dress in a pile of miscellaneous junk in the basement. By the time Mr. Karen and Mom and I left to have dinner Friday night at the restaurant my niece works at, the dumpster was full. Unfortunately, neither the basement and garage were close to empty, but at least there was 40 cu. yards less stuff in them when we started. Now that I’m home, I’ve got to get after my own basement, but there’s always something else to do that’s more important or more fun. Maybe some behavior modification is in order, except first I need to figure out some rewards that are neither food nor stuff but which still motivate me.